The enemy has capitulated. It is fitting that I address myself in thanks directly to the officers and soldiers of the American Expeditionary Forces who by their heroic efforts have made possible this glorious result. Our armies, hurriedly raised and hastily trained, met a veteran enemy, and by courage, discipline and skill always defeated him. Without complaint you have endured incessant toil, privation and danger. You have seen many of your comrades make the supreme sacrifice that freedom may live…. I congratulate you upon the splendid fruits of victory which your heroism and the blood of our gallant dead are now presenting to our nation. Your deeds will live forever on the most glorious pages of American history. 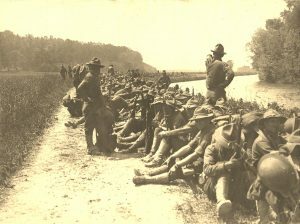 April 2017, marked the one hundredth anniversary of the entry of the United States into World War 1 and the first Doughboys arriving in Europe. It may be a surprise to many how a nation, whose president won the office running on the slogan of , “He kept us out of the war!” could now, only four months later, be enthusiastically sending its next generation of men into the conflagration that had already ravaged much more than that of the British, French, Russian, Austrian, and German peoples. The Yanks were coming and many were unprepared for the correct answer to the following question. “What would be the cause of more deaths, by a long shot, than any other single killer during World War 1? Using these weapons (and others not listed like the tank and airplane), not counting the wounded, the Allies suffered somewhere from four to five million soldiers dead. The Central Powers, or the Germans, Ottomans, and Austria-Hungarians, lost somewhere between three to four million. Total dead world-wide, around ten million, with between twenty-two to twenty-four million wounded. But, even a high total of combat casualties (over thirty-four million) does not even approach the lowest estimates of the deaths caused by the Spanish Influenza, which some speculate even today was a German plot gone wrong. La Grippe, as the French called it, or the Spanish flu spread all over the world, even to the Arctic wastes. Total estimates range anywhere from between 50 to 100 million dead. Some historians state that this likely makes it the deadliest “natural” disaster in human history, if indeed it were a natural one. Still, there is little doubt that the trenches of the battlefields provided the incubator for the virus to turn more deadly than any flu ever. It has been estimated that 500 million souls, or one third of the planet had been infected. The Spanish Lady continued her lethal campaign after the war, well into 1919, ultimately killing upwards of 600,000 Americans, five times the number lost on the seas and battlefields during the war, making it the worst epidemic in American history. Who Were The Doughboys Who Went Over There in World War One? The lads who went to France, as well as Italy, Russia, and those Doughboys scattered elsewhere, where not just the city-slickers and raw farm boys of America who already knew how to shoot. A large contingent were immigrants, freshly arrived in their new home, the U.S. Most had never held a rifle, many could not even understand the English orders officers would give. This site is devoted to the discovery of the soldiers we know as the Doughboys. We will discuss who they were, and their machines, equipment, and environment.